Those who dream of a white Christmas in Minnesota are likely to see their wish come true: the chances of snow cover on this holiday vary from 60 percent in the south to 100 percent in the north. While virtually all Christmases are white in International Falls (Koochiching County) and Hibbing (St. Louis County), three-fourths meet that standard in the Twin Cities, and even the less-snowy landscapes of Worthington and Redwood Falls show a 60 percent or better chance of a white Christmas Day. 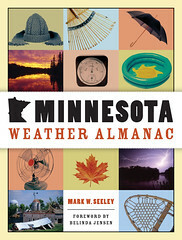 Additionally, snowfall of some sort occurs between Christmas Eve and New Year’s Day at most Minnesota locations about 85 percent of the time. And, in the Twin Cities area, snow is observed on Christmas Eve and/or Christmas Day approximately 43 percent of the time. Gifts like sleds, skis, snowshoes, snowmobiles, caps, and gloves thus have a high probability of immediate use. Not every Christmas holiday is white, however. Lack of snow–defined as the absence of both snow cover and snowfall on Christmas Day–has been a reality in the Twin Cities ten times in the past 60 years: 1949, 1958, 1965, 1967, 1977, 1979, 1986, 1988, 1997, and 2002. Described as “brown Christmases,” they have often been followed by 20 or more inches of snow, redeeming the balance of the season for those who crave a snow-covered landscape. The state record snowfalls for Christmas Eve and Christmas Day, respectively, are 15.5 inches at Isabella in Lake County in 1959 and 14 inches at Albert Lea in Freeborn County and Theilman in Wabasha County in 1945. All-time state temperature records for Christmas Eve originate from the same decade of the nineteenth century: a high of 57°F at Northfield in Dakota and Rice counties in 1888, and a low of -43°F at St. Vincent in Kittson County in 1884. Christmas Day records include a high of 62°F at Faribault in Rice County in 1923 and a low of -50°F at both Big Falls in Koochiching County and Orr in St. Louis County in 1933. Many holidays are memorable for somewhat intolerable weather. For example, Christmas Eve and Christmas Day 1903, 1933, and 1934 each brought cold wave warnings and wind-chill readings of -25 to -45°F; consequently, most Minnesotans celebrated quietly at home. On Christmas Eve and Christmas Day 1945, 20 hours of continuous snowfall blocked roads and required snowplow operators to work the holiday in southern Minnesota. In 1982, two separate winter storms paralyzed many communities, dumping 10 to 18 inches of snow between December 24 and 31. Both storms produced thunder-snow, and the second brought a coating of glaze ice up to 1 inch thick, causing extended power outages in the southeast. Perhaps the most amazing Christmas weather story is one related by St. Paul weather historian Tom St. Martin. In 1879, following snowfalls totaling several inches just before the holiday, a strong high-pressure system ushered in an arctic air mass. Christmas morning brought record cold temperatures to the Twin Cities: -38°F at the Signal Corps Offices in St. Paul and Minneapolis and -39°F at Fort Snelling. The St. Paul Dispatch reported that the intense cold was “very discouraging to outdoor amusements and even [interfered] with visits of friendship, courtesy, charity or religion.” It added, “yesterday will be long remembered as the cold Christmas.” The coldest Twin Cities Christmas morning since then was in 1996, with a temperature of -22°F. In the Twin Cities area, extreme wind-chill factors have occurred on Christmas Eve 1983, -54°F, and on Christmas Day 1903 and 1934, -40°F. At these temperatures, exposed human skin can freeze in as few as ten minutes. There have been streaks of three consecutive Christmas Eves and Days when wind-chill factors exceeded advisory criteria. Perhaps the worst stretch occurred from 1933 to 1936: these four holiday seasons were plagued by wind-chill conditions ranging from -20 to -40°F. These readings, on top of statewide agricultural and economic failures, must have truly tested the Christmas spirit. The chilliest week preceding Christmas occurred in 1983, when most Minnesota locations reported average daily temperatures that were 30 to 35 degrees below normal. Even in the Twin Cities’ urban heat island the average daily high was -5°F and the average low -21°F. Ten to 30 inches of snow cover around the state amplified the effects of every polar air mass during the month, making December 1983 the coldest of the century. In fact, only the pioneer era records for 1822, 1831, and 1872 showed colder Decembers. The warmest week preceding Christmas in the modern Twin Cities record is a virtual tie between 1923 and 1931, both of which show an average temperature of 35°F, about 17 degrees above normal. In 1923 there was no snow cover until a storm on December 27, while in 1931 the ground was brown until 1.6 inches of snow fell on Christmas Eve. These readings cannot compare, however, to the warmest-ever Christmas week in the pioneer record. In 1877 the average daily temperature for December 18-24 was 42°F at Fort Snelling and 40°F at Minneapolis. The Mississippi River was ice free to the north of St. Anthony Falls, and some flowers bloomed as late as December 28. This climate singularity is best remembered as the “muddy Christmas,” when abundant rainfall made travel difficult for other than the usual reasons.